To aid in the collection and storage of our booty and plunder - and to help us careen our ship when it be clogged with barnacles and other denizens of the high seas - we have our own camp which we be willing to set up wherever the need requires. We have tents and awnings in which to protect ourselves from the elements and for us to catch our beauty sleep. We have our own fire so that we be able to sustain ourselves and keep the chill from our bones. We have trunks and chests in which we may store our booty safely and to help us transport it to our home port or any other port 'o call for trading with the fine merchants who appreciate our merchandise most keenly. We also have many other goods and equipment which a pirate needs to maintain his chosen trade. 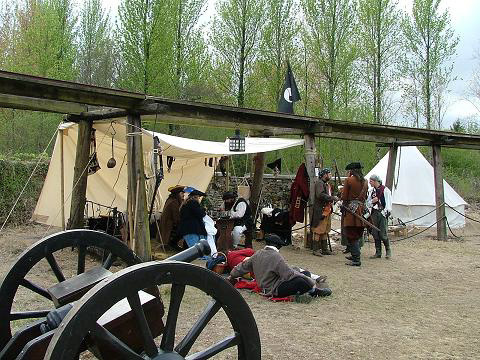 This be including musket ball making equipment, table and benches to that we be able to take our ease. We also be owning both dice and cards so that we may while away the small hours between capers with many a fine game of chance. This but be part - although a big part - of what we have to call our own.